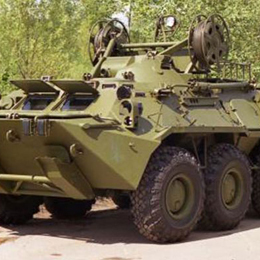 The BTR-82A APC features a much higher fire power, agility, protection and controllability compared with the production-standard APCs of the BTR-80 family. Its fire power has been boosted through introducing a commonised fighting module equipped with power drives and the two-axis digital stabiliser. The main armament of the module is the 30-mm 2A72 automatic gun. There is a 7.62-mm PKTM coaxial machinegun available. Both are outside of the manned compartments of the APC and do not contaminate them with cordite smoke. 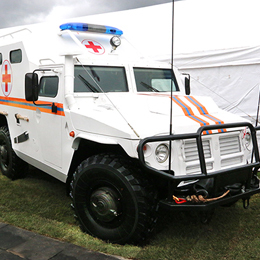 This, in turn, increased the comfort of the APC’s occupants. The design of the commonised module allows installing various guns and machineguns, including foreign-made ones. 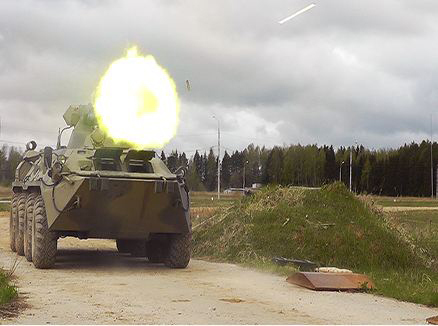 The day/night stabilised gunner’s sight in the fighting module beefs up the target acquisition capability and boosts the effectiveness of fire over that of the BTR-80A. The advanced APC’s protection was beefed up with a spall liner on the inner surfaces of the hull, including the floor, an advanced blast-absorbing hull bottom design and improved shock-absorbing seats for the crew and infantry squad. The solutions protect the troops and APC against armour-piercing ammunition of basic infantry weapons fired at a range of up to 100 m and from spall. 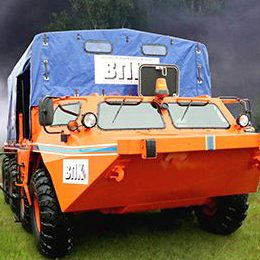 The upgrade of the BTR-82A’s fire-suppressant system has raised its fire/explosion safety. The vehicle has boasted a 20% overall survivability increase. Despite a certain increase in the APC’s weight, its agility improved owing to a more powerful diesel engine (300 hp instead of 260 hp) and the sophisticated transmission and suspension. The measures extended the vehicle’s service life, increased average cross-country speed, enhanced the smoothness of the ride (this is important for accurate fire on the move) and reliability of the chassis as a whole, with the APC having retained its high amphibious capability. The command and control of the APC has been increased by its up-to-date digital communications, topographic orientation system and day/night commander’s observation device. The BTR-82A is equipped with the air conditioning system to create comfort for the crew and infantry squad and reduce their fatigue on marches and in battle, especially in hot climate, and to create the optimum conditions for the vehicle’s electronics. 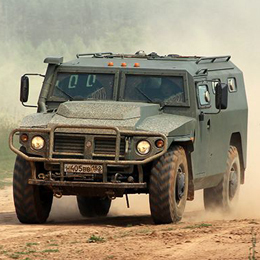 The BTR-82A’s self-contained diesel-generator set providing power supply without having to start the main engine gives the APC a considerable edge over other vehicles of the family. 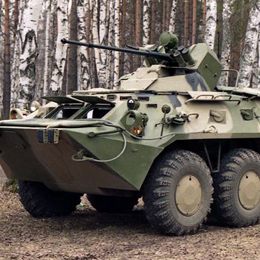 Overall, the BTR-82A APC’s combat effectiveness ratio has doubled over that of the production-standard BTR-80A.